Time Frame of Lesson: 25 minutes + catching fireflies! Overview of Lesson: This lesson gives kids the chance to explore nature. It instructs how to turn any clear cup, jar, or any container into a temporary home for a firefly. After reading a book such as The Very Lonely Firefly by Eric Carle or Fireflies by Sally M. Walker, kids are encouraged to go outside, catch fireflies, and keep them in their firefly homes! Kids will enjoy observing their catches, and once they’re done, don’t forget to release the fireflies outside! Wash your container to make sure it is completely clean. Place the cup/jar upside down on the piece of paper. It should be in the middle of the paper. Trace the shape of the top of the container with the pencil. Draw a bigger circle at least 1 inch from the circle you traced. Cut out the circle, along the line of the big circle. Fold the circle in half. Fold it in half again. Unfold the paper. Along each fold, draw a line from the edge to the small circle. Cut along each line. Only cut to the small circle! Now we will make small holes in the small circle. That way air can go in and out of the container so the fireflies have fresh air to breathe! Make 5 small X’s on the paper, like in the picture. Look at the picture below for this step. Starting with the middle X, fold the paper along one line in the X (along the red line). Once the paper is folded as in picture (2), make a very small cut along the line of the X that you can see. Only cut a small snip, like the scissors below. Unfold the paper and fold the paper along the other line of the X (along the blue line). Make another small cut along the X that you can see. Repeat this step with all the X’s. Be careful when cutting these holes. If they are too big, fireflies might escape through them! Place the paper on the top of your empty cup/jar. The small circle should line up with the opening in the cup/jar. Fold two flaps over the edge of the cup/jar. Overlap the flaps and tape them together. Overlap the next flap and tape it. Continue to tape all the flaps until there are only two left. Do not tape the last pair of flaps; that way you can put the lid on and off the jar while catching fireflies. Look at the final picture to see how the flaps are folded and taped. If the paper is not folding well, you can cut more flaps. Cut straight lines from the edge of the big circle to the edge of the small circle. Once it is dark enough to see the glowing fireflies, go outside and try to catch one! When you catch one, put it in the jar/cup and place the lid on the cup; use the rubber band to hold the lid to the cup. Have fun observing your firefly and remember to release it after you are done! 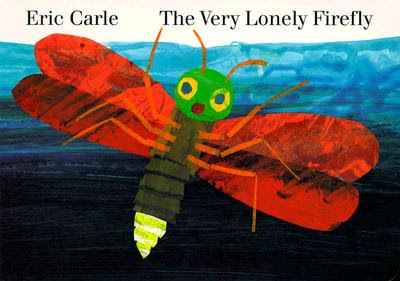 Older readers will enjoy this easy-to-read, nonfiction book about fireflies. They will learn how fireflies glow and grow, what they look like, and even the dangers they encounter! An educational and exciting choice for second to third graders.